It has been a rough start to the year for Nets, and a date with Indiana could not come at a worst time. 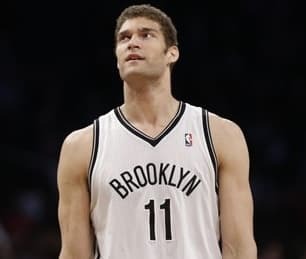 Finally seeming to find their stride, Brooklyn suffered a rough injury to center Brook Lopez on Friday’s 121-120 overtime loss to the 76ers. He suffered a broken foot, the same injury that limited him to just five games last season. He also had offseason surgery to repair the foot and his status for the rest of the season is now up in the air. The injury has cast a black cloud on their franchise and season. The 9-17 Nets are just 2-7 without him, but they have gotten some key players back, including point guard Deron Williams who is averaging 17.8 points per game and 10 assists since returning from a sprained ankle. Guard Jason Terry and forward Andrei Kirilenko is also close to returning. The 22-5 Pacers have not suffered the same hiccups that the Nets have gone through, and have bounced back in a big way after suffering their first losing streak of the year within the past two weeks. They blew out Houston on Saturday and easily handled the Boston Celtics on Sunday, winning 106-79. Lopez’s injury is the main reason for my play in his game. The frontline of the Nets will not be able to compete with Roy Hibbert and the Nets are in for a beating down-low. We already saw the dominating performance they had in the paint against Boston, and it will be more of the same on Monday night. Furthermore, Indiana continues to get stronger. Danny Granger is getting of plenty of minutes as he gets put back into the rotation, and the team is getting quality minutes from all of their lineups out on the floor. The Hawks head into Miami, a place they have struggled, playing some of the best basketball of the season. Atlanta looks to extend their winning streak to four games and have started to truly thrive under head coach Mike Budenholzer’s system. They average the most assists per game in the NBA with over 25 and have been even better dishing it during their current run. The Hawks improved to 15-12 on the year after a 118-85 win over Utah on Friday. They have one lone meeting against the Heat this year, a Nov. 19 loss. They turned the ball over a whopping 24 times in the 104-88 loss and will look to avenge that defeat tonight in Miami. The defending Champions have not played poorly by any stretch of the imagination, but the Heat have shown some chinks in their armor as of late. If there has been one weakness for Miami it has been the presence of opposing big men. That fact was on full display on Friday as they lost 122-103 to the Sacramento Kings. Miami allowed the Kings to score 60 points in the paint and win the rebounding battle, and they shot just above 58 percent from the field. This is a revenge game of sorts for Atlanta, and it could not have come at a better time. Miami’s recent hiccups and the Hawks recent strong play make the 8.5 line awfully generous in my opinion. They can prove themselves in this game and should be focused tonight at American Airlines Arena. With Atlanta’s frontcourt advantage and the improved play of guard Jeff Teague, I think this one stays within single digits. The new-look Raptors look refreshed and better than ever as they head into San Antonio to take on the Spurs. Toronto is 4-1 since trading Rudy Gay to the Sacramento Kings and have looked like a totally different team since the move. They rallied from 19 points down to grab a 109-108 victory at Dallas on Sunday and broke Oklahoma City’s win streak on their home floor on Sunday. Kyle Lowry scored 22 points and Amir Johnson added 17, and 13 as the Raptors dominated the fourth quarter in route to the 104-98 win that gave the Western Conference-leading Thunder their first loss at the Chesapeake Energy Arena. The victory put them at 11-14 on the season. The Spurs beat the Raptors on December 10th, but this was a different team that had not yet received the full complement of players due to the trade. San Antonio won that game 116-103. They boast the second-best record in the West at 21-6 and are coming off a 113-100 loss to Oklahoma City on Sunday. Love the Raptors in this spot. They are playing some excellent basketball and getting rid of ball-hog Rudy Gay could not have been a better move. The Spurs defense has lacked recently, and few teams are scoring more proficiently than Toronto right now. This one should be close than the -11 number indicates.